A thriving garden is a testament to the effort of the gardener, and knowing what to do with and for the plants in it is part of that effort. Roses are an ornamental flower that have been popular worldwide for centuries. As a centerpiece for a garden, they add a touch of elegance, and investing properly into their care pays off. Mulch is a catch-all term for any material spread over the surface of the soil around the base of a plant. It insulates the root system, helps retain water in the soil, prevents weeds from gaining a foothold and helps regulate the temperature of the soil itself. 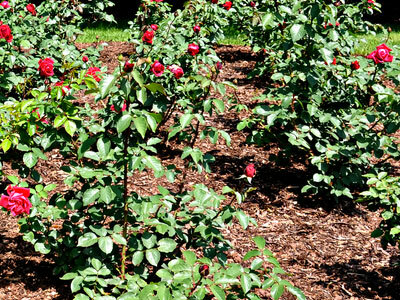 There are a multitude of mulch varieties available, so how do you choose what’s right for roses? The majority of available mulches are organic- they decompose, provide additional minerals for the soil and provide nutrients for the roses. As organic mulches decompose, they draw nitrogen in order to break down. This can draw the nitrogen from the soil, so it’s best to layer compost down first before adding organic mulches. Apply at least a 2″ (inch) layer of compost before spreading mulch in order to keep your roses healthy. Grass clippings, straw, shredded or chipped bark and even newspaper can comprise organic mulch. For appearances, chipped bark mulch- usually native hardwood chips- is extremely attractive, but grass clippings or pine needles are a cheaper option. When using your own garden clippings, ensure that you’re not spreading any herbicide-treated or possibly diseased material around healthy roses. Among organic mulches, grass is one of the fastest to decompose, but can become slimy and give off an odor which may contrast with the fragrance of your roses. Straw is more beneficial for vegetable gardens, and tend to attract insects which are necessary to a healthy crop, and may not be as suitable for ornamental plants. Newspaper is less attractive visually, but can be used without worrying about detrimental affects on roses. Shredded leaves have the benefit of boosting underground activity, such as with earth worms to aerate the soil, and are free for those with deciduous trees. A benefit of organic mulch is the fact that it decomposes. While you will have to layer on fresh mulch every year, the decomposing mulch becomes the next layer of compost. Mircoorganisms in the soil break down the available material, lowering the soil level and providing ample room for the next layer of mulch. Doing this imitates the natural structure of a forest by allowing natural debris to become the compost for the next year’s growth. Inorganic mulch does not decompose; this is usually a layer of small rocks, pebbles or even gravel. While it doesn’t move about as organic mulch could during a particularly windy time of year, it can absorb sunlight and heat the root zone of your plants. Inorganic mulches are best for northern climates. They do not create more work when it comes to fertilizing; simply sprinkle the fertilizer over the gravel, rake it around the base of the rosebushes and water it well. This allows the water to dissolve the fertilizer and drain through the gravel to reach the root system. When selecting your mulch, consider how often you may be adding plants to your flower bed and keep your climate in mind. Smaller, swiftly decomposing mulch is not as easy to rake aside as bark, and inorganic mulch may be smothering for gardens in southern climates. Look around at gardens in your area and observe what tends to be most commonly used. Mulch is absolutely necessary for a thriving garden, so do a little research, observe your roses and enjoy the results of healthy root systems and weed-restrictive layering!